In this year's Fandom Steel Cage Match (at f_march_madness), some of the choices have hurt me in my soul. First thingswithwings wrote some Hermione/Katara in response to that pain - Theory In Practice, and it's faaaabulous - and then I wrote this. 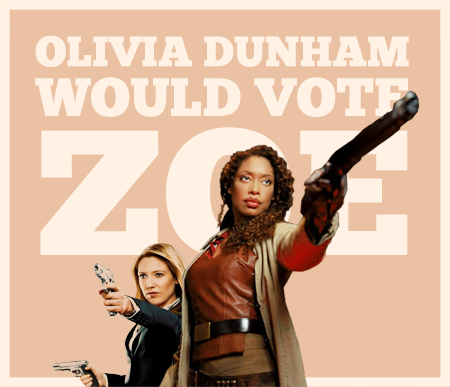 Zoe and Olivia are both winners in my heart. Set post-Serenity, with Fringe spoilers through 'Jacksonville'. Zoe first met Olivia in a dingy bar on a particularly disreputable moon. The crew of Serenity were temporarily stranded here, for reasons that were entirely the captain's fault and involved a shoot-out in the engine room. Kaylee still wasn't speaking to him. The new parts they needed to fix the ship were taking a while to arrive, and so in the meantime they spent a lot of time in bars and tried to keep themselves out of trouble. Zoe estimated they had about half an hour left before that plan broke down entirely. She noticed the woman in the corner immediately, because it was her job to notice everything, but a lone woman bonding with a glass of whiskey like it was her only friend didn't stand out in a place like this. Then the woman looked up at them and did a double take. "My god," she said, getting slowly out of her seat and staring straight at River. Zoe instantly stepped in front of River, shielding her from view and resting her hand on her gun. River pushed right past her and ran towards the woman, throwing her arms around her. "Wait, what?" said Mal in bewilderment. "I have no idea," said Simon. River turned back to them, happier than Zoe had seen her in quite a while. "Everyone, this is Olivia. She's my friend." Olivia, as it turned out, was another product of the Alliance's 'Academy'. She told them about government experiments and a drug called cortexiphan and all of the other horrors she'd seen. "Went back a few years ago and got myself hired as a security guard so I could try and break some of the kids out." Olivia shook her head. "I didn't get very far." But River was smiling, and reached out to hold Olivia's hand. "You used to bring me flowers." "Yes, I did. I'm so glad you're all right, sweetheart. I'm going to help Simon help you, I promise." Olivia’s voice turned fierce, clearly protective of River the same way they all were. Zoe was happy to see it. "And we can help you," Zoe said. "You want to take down that school; so do we. If you know the security layout, that's a good start." "Oh, are we overthrowing the government again?" Kaylee asked. "Shiny." Olivia smiled at that. "Yeah, it looks we are." Zoe and Olivia stayed up after the others went back to Serenity for the night. Zoe didn't sleep much these days, and she guessed that Olivia didn't either. They talked soldier to soldier for a while - serious at first, but then descending into absurd war stories. Zoe was delighted to find a wicked streak running through Olivia when she let her guard drop a little, and Zoe felt lucky to be allowed behind some of Olivia's defences. Olivia told her stories about the things that she’d seen, aftereffects of experiments gone wrong. Zoe wasn’t sure she believed everything Olivia said about shared consciousness and parallel dimensions, also a lot of her stories seemed to involve at least one exploding head, but she liked to listen anyway. Olivia was smart and forthright and never let her stoicism slide into coldness. Zoe liked her immediately, and was beginning to feel another kind of liking, too. It had been a long time, and it felt good. She rested her hand on top of Olivia's on the table. Olivia leaned in close and turned her wrist so that they were shoulder to shoulder, palm to palm. Three days later, Olivia stowed what few possessions she had in her bunk while Kaylee installed the new engine parts. Olivia looked around and nodded to Zoe, satisfied. "Good ship you've got here." "The best," Zoe agreed. "Let me show you around." She loved watching Olivia meet Serenity for the first time, her eyes wide with appreciation. After they'd been to the kitchen, the last stop on their tour, Olivia caught Zoe's arm in the dim light of the corridor. "Welcome aboard," said Zoe, and kissed her at last. :DD So glad you enjoyed, thanks! Thank you! The idea of these two hanging out makes me super happy. ETA: oh man though I just realised that you could've called this fic Zoe Liked Olivia! Maybe I've been reading too much Woolf. But! Zoe Liked Olivia! Yayayayay this is fantabulous! Perfect integration for Olivia in the Firefly universe, I agree. Aww this premise. Love it! What a fabulous poster, eee! Thanks very much!